14 gallon approx. 57 lbs. 1. Requires no energy to prevent freezing. No gas or electric wires to cause potential shock. Combination of drinking baffle and underground air temperatures ranging from 45 – 48 Degrees F, keeps drinker from freezing with very few animals drinking from it. Heavily insulated with high density urethane foam. For extreme winter conditions, electrical deicer can be used. 2. 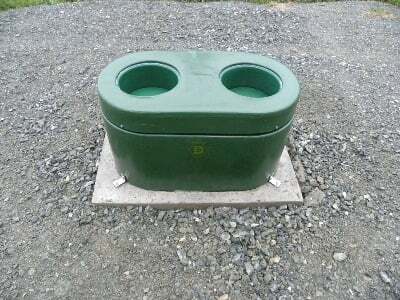 Can be used for all sizes of livestock. Thermacap takes almost no effort to tip enabling even the smallest of animals to drink from. Lower height of drinker also allows for easy access for smaller animals. From mature bulls and horses to calves, goats and lambs, the drinker is ideal for all types of livestock. 3. Design of drinking baffle and insulated Thermacap keeps cold out even when drinking. ENERGY FREE TO APPROXIMATELY –20 Degrees Below Zero. 4. Extremely durable. Made of rotational molded Polyethylene. Will not rot or rust. Rounded corners to ensure durability and safety. 5. Top quality parts. Stainless steel hardware (screws, bolts mounting brackets). Franklin float valve. 6. Virtually Maintenance Free. Aside from periodic cleaning, many drinkers have remained in use trouble free for over 20 years. Easy cleaning design. 7. Long warranty. 5 year warranty on drinker body. 2 year warranty on valve. 8. 30 Day Satisfaction Guarantee. If you are dissatisfied with product you can return to Ameriag for a full refund less shipping within 30 days of purchase. 9. Anti siphon valves used on all models. 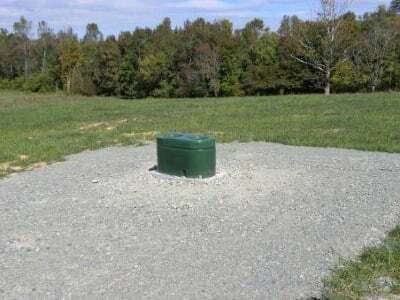 Will work under gravity flow or pressure water systems. 10. User friendly design allows for easy cleaning and service of drinker. 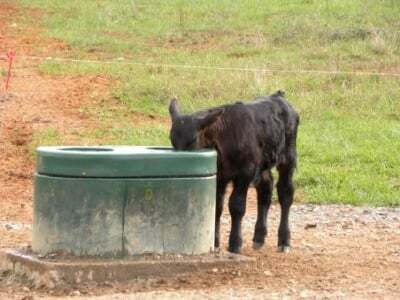 2 week old angus calf drinking. 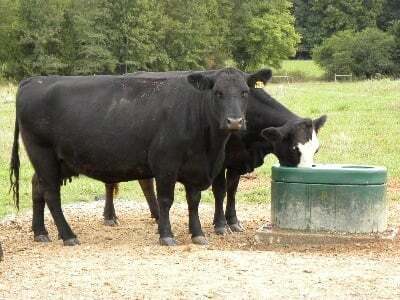 Unlike many drinkers on the market, livestock of all types and sizes can easily obtain water. From small lambs and sheep to mature bulls, the Energy Free Drinker is easy to use and maintain. 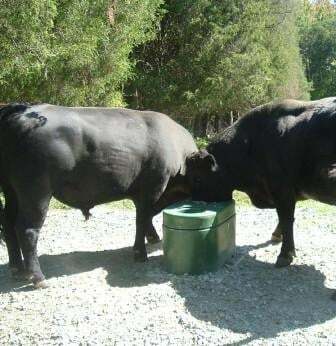 As shown in this photo, The Drinker works well with large animals such as these 2 mature Angus Bulls.